On February 9th the 4th Season of The Walking Dead will air. Therefore we decided to bring the Walking Dead to the Spotlight! This week you can expect some in-depth information about the franchise. 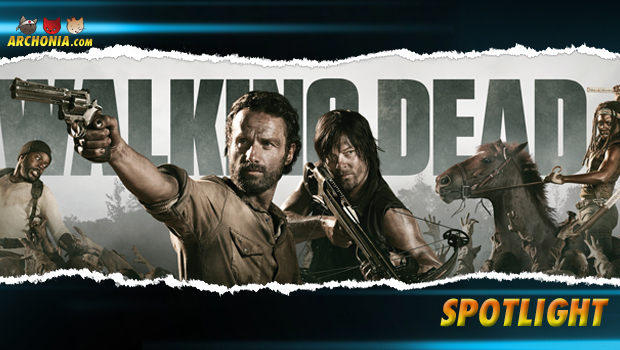 Brought in black and white, **The Walking Dead **is a monthly comic book series. The story revolves chronicling the travels of Rich Grimes, his family, and other survivors of a zomie apocalypse. First published in 2003, by publisher Image Commics, the comic created by writer Robert Kirkman and artist Tony moore. From issue #7 Moore was replaced by Charlie Adlard, though Moore continued doing the covers until issue #24. In 2010 the comic won the Eisner Award for Best Continuing Series at the San Diego Comic-Con International. In the TV series, developed by Frank Darabont, Andrew Lincoln stars as Rick Grimes, who awakens from a coma to find the world dominated by flesh-eating walkers. He sets out to find his family. The Walking Dead premiered on October 31, 2010 on channel AMC in the United States. Due to its good reception, AMC decided to renew the series for a second season, and very soon after the kick-off of season 2 they announced a third season. Now the series is couting down for its 4th season this februari. Two novels were added to the franchise in 2011 and 2012. Telling the background story of two infamous characters, “The Walking Dead: Rise of the Governor” and “The Walking Dead: The Road to Woodbury”, are about the Governor and Lilly Caul. Expect some in-depth articles about The Walking Dead this week! Meanwhile check out the 6 minute preview of Season 4 with interviews. Previous Post : Alien universe reboot cover art revealed! Next Post : Loki presented by Hot Toys!